The 7th European Biosafety Summit, organised by the European Biosafety Network (EBN) in partnership with the Ordre National des Infirmiers (ONI), took place at the National Assembly in Paris on Thursday 18 January 2018. The Summit focused on the implementation of, and adherence to, the 2010 European Sharps Directive in Europe and in France, hearing from a variety of speakers from across the healthcare sector about how to improve compliance with the Directive and good practice going forward. The audience consisted of nurses, healthcare workers, professional associations and industry representatives from all over France and Europe, all keen to put across their point of view and personal experience to the speakers and the rest of the attendees. 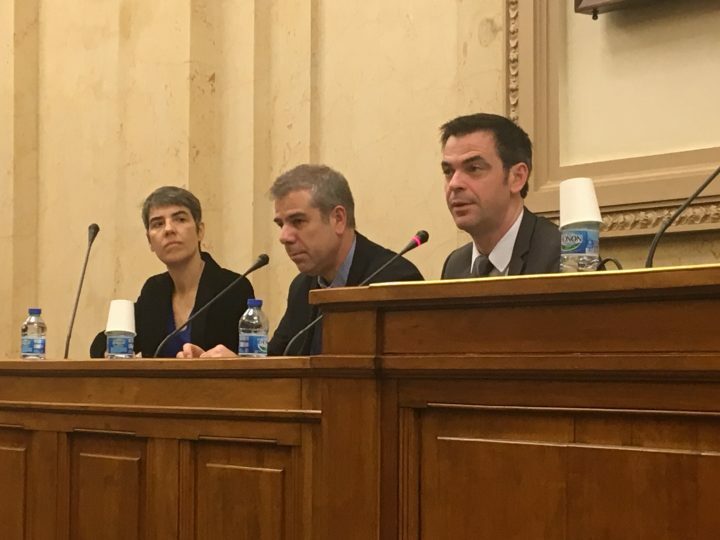 The European Biosafety Network and ONI both hope that this successful summit proves to be a catalyst for more dialogue around sharps injuries in France going forward, and we look forward to continued engagement with the French Health Ministry, trade unions and European institutions in the future. The Summit began with an address by Patrick Chamboredon, the newly elected President of ONI. He stressed the importance of reporting needlestick injuries and suggested that more needs to be done to stem the flow of such injuries in France. He also suggested that there needs to be more awareness of the risks of sharps injuries to French healthcare workers and that a collaborative approach with the authorities is required to achieve this. Chamboredon declared that the Summit was the perfect forum in which to discuss these concerns and to use it as a vehicle going forward. Following Chamboredon, the French député hosting the summit, Olivier Véran, gave a short address to the audience. He also stressed the importance of reporting needlestick injuries to the relevant authorities, but admitted that the current framework in France makes comprehensive analysis and monitoring of injuries difficult. Encouragingly, he declared that, if ONI were to draft reasonable legal amendments surrounding needlestick injuries, he would submit them for discussion with the Social Affairs Commission within the French Assembly, of which he is the rapporteur. He also suggested that they could be submitted for consultation with policymakers who deal with French healthcare strategy at a national level. The summit then heard from Arlette Maerten, a French nurse who suffered from a needlestick injury. Her testimony highlighted the relative misunderstanding of sharps injuries in France and how a more thorough framework is required to ensure that victims are heard and not simply lost in the system. 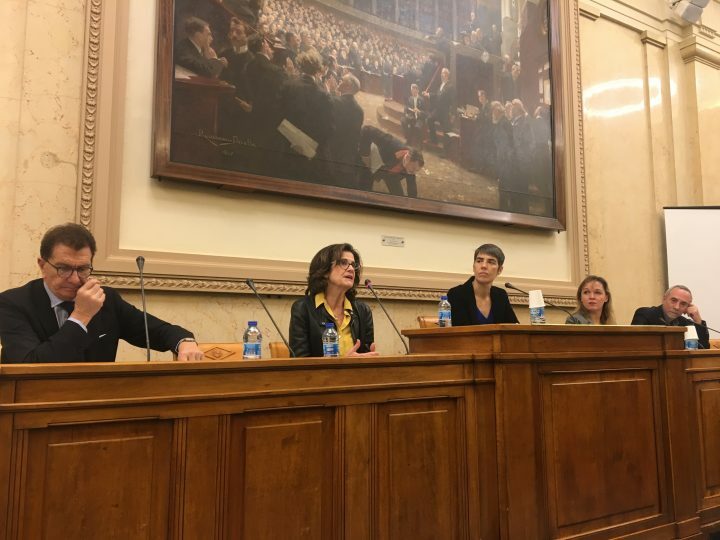 The testimony also suggested that the gravity of needlestick injuries is not universally understood in France and that more needs to be done to reassure nurses and other healthcare workers that policymakers understand their worries and concerns. The first session of the summit focused on the implementation of the 2010 Sharps Directive at a European level. This opening session proved a useful reference point for discussions later in the day around the implementation of the Directive in France, and how lessons from other European member states can be used when considering the French situation. The first contributor to this session was Ian Lindsley, Secretary of the European Biosafety Network. His presentation focused on the history of the EBN – founded in 2009 to ensure the uniform implementation of the Directive across EU states – and some of the difficulties it has encountered over the past nine years. He detailed figures from a 2016 EBN survey which demonstrated that there was still a good degree of variation of awareness around needlestick injuries and their potential seriousness in different EU countries, a full three years after the passing of the Directive into national legislative framework of respective member states. He concluded his presentation by explaining that more needs to be done to ensure compliance with the Directive across member states, particularly when it comes to workers who do not use sharps in a hospital setting, such as social care workers and freelance health professionals. Following Ian was Valeria d’Agostini, a representative of the European Commission health and safety unit who advises member states on the implementation of the Directive; she is a lawyer in the Employment, Social Affairs & Inclusion division of the Commission. Her presentation focused on the challenges that the Commission faces when it comes to the implementation of the Directive; namely how best to ensure good practice across all member states as well as ensuring adequate awareness of the risks of needlestick injuries to national governments, who are often unaware of the potential dangers posed to their own citizens. She spoke of the varying levels of compliance within member states and of the need for effective monitoring systems to improve standards and reduce the instances of injuries. Next was Maryvonne Nicole, vice-president of the European Public Service Union’s (EPSU) Health Committee. EPSU is the authoritative trade union for European workers, representing over eight million people in dialogue with employers, governments, European institutions and other trade unions. She discussed how needlestick injuries are firmly on the agenda of EPSU as well as CFDT: Santé Sociaux – a French trade union that she advises on health and safety. She detailed an EPSU study that will aim to uncover the extent of needlestick injuries in France and what more can be done to raise awareness, especially in terms of getting an adequate number of responses to the survey from all stakeholders across France. Dr Gabriella di Carli from the Italian National Institute of Infectious Diseases followed, focusing specifically on the implementation and effectiveness of the Directive in Italy. She cited Italian studies that have examined the prevalence of needlestick injuries since the implementation of the Directive. She concluded that knowledge of the legislation is at a good level and that hospital sites have responded to the need for more safeguards, though the level of awareness could still be better; needlestick injuries have certainly been reduced in Italy but by no means eradicated entirely. She suggested that standards will not just be improved by the adoption of new equipment or resources, but also by the education, training, and enthusiasm of healthcare professionals; adoption of new standards must come from within and cannot simply be imposed on workers from above. In similar fashion, Jose Luis Cobos Serrano of the Spanish Nurses’ Council gave the Spanish point of view to the audience. He laid out the activity and findings of the Spanish Observatory on Biosecurity, which has constantly been monitoring centres in Spain since the implementation of the Directive. He detailed similar results to Dr di Carli in Spain, showing that awareness of needlestick injuries has dramatically risen since the implementation of the Directive into national legislation in 2013 though, again, he detailed that more needs to be done to foster a more cohesive, collaborative approach to the prevention of sharps injuries. Measures he suggested included a better monitoring framework, improved training methods for healthcare workers, better communication and relations between different healthcare stakeholders, and more concrete recommendations and proposals for legislative changes to health policymakers. This session zoomed in more specifically on the French situation when it comes to the prevalence of sharps injuries and how the 2010 Directive can be better implemented within French hospitals and healthcare settings. The audience heard from a number of experts from all corners of the French healthcare system about how workers can be better protected, how employers can provide more safeguards for their staff, and how technology will play a vital role in driving up prevention standards. The first speaker in this session was Yann de Kerguenec, a director at ONI. He presented the results of a survey of nurses carried about by ONI between November and December 2017 which aimed to shed light on the prevalence of needlestick injuries amongst ONI’s membership. The survey provided 10,782 complete responses and threw up some interesting results. 7,325 nurses responded that they had been directly exposed to blood over the course of their careers, with 3,559 saying that their latest accident had come in their current job. Of the 7,325 nurses who had been exposed, 5,537 of them said that the cause was a needlestick injury, with almost all of them being alone at the time of the incident. 5,420 nurses suggested that their accident could have been avoided, whether this be through better safeguards, equipment, training methods, or rather more attention to detail when stressed or fatigued. Only 4,545 out of the 7,325 nurses who had an accident reported it, meaning more than more 3,000 kept it to themselves, with many citing a lack of time or knowledge of protocol as the reason for not doing so. Most nurses suggested, though, that they knew the correct procedures when it came to exposure and had indeed had adequate training. This survey demonstrated, above all, that sharps injuries still occur somewhat regularly in France despite the introduction of the Directive into national legislation in 2013. Commenting on the results of the survey, Gérard Pélissier of GERES (Groupe d’Etude sur le Risque d’Exposition des Soignants) detailed how ONI’s results are conistent with what GERES has seen in the past when it comes to needlestick injuries. The problem, he detailed, is that his organisation stopped periodically monitoring the prevalence of sharps injuries in 2015, so the data that they have is somewhat dated in terms of its accuracy. 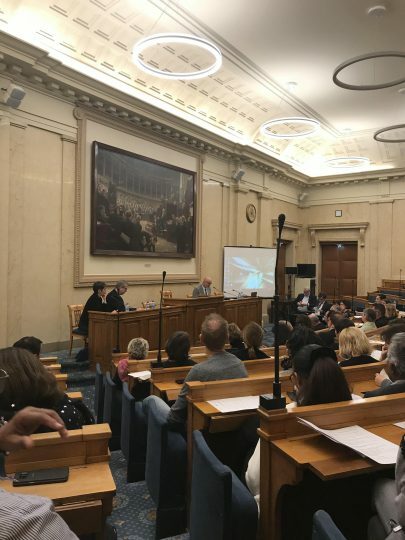 The audience was delighted to hear, though, that GERES is to resume the monitoring of needlestick injuries in order to produce more up to date statistics that will support conversations with the French authorities over how to reduce the prevalence of sharps injuries in France. Next to address the audience was Dr Pierre Parneix of SF2H (Société française de l’hygiène hospitalière). SF2H is a body that seeks to promote good practice terms of healthcare worker safety and is one of the eminent voices when it comes to the prevention of infection and accidents amongst healthcare workers. He spoke about the risks of needlestick injuries to French healthcare workers and, like various other speakers, suggested that there need to be more stringent reporting mechanisms for workers who often do not know how to report an accident or injury, sometimes out of a lack of knowledge but also out of fear that they may have been adjudged to have done something wrong. Dr Parneix also called for better collaboration with healthcare policymakers to ensure the effects of sharps injuries become better known outside medical circles. Nicolas Chandellier, Director of BD (Becton Dickinson) in France – a large manufacturer of medical devices – as well as a board member of SNITEM (Syndicat National de l’Industrie des Technologies Médicales), spoke about the role that new technologies will be able to play in France when it comes to reducing the prevalence of needlestick injuries. He suggested that there needs to be a dual focus on both national legislation and the use of new technology in order to make a tangible difference to healthcare workers in France, suggesting that, in other countries where new technologies have been adopted, there has been a good level of success. It is important, he suggested, that industry is consulted when looking for solutions to healthcare worker injuries. The last two speakers to address the second session were Dr Bernard Gouget of FHF (Fédération hospitalière de France) and Laetitia Buscoz of BAQIMEHP (Bureau de l’assurance qualité et de l’information médico-économique de l’hospitalisation privé), representing public and private sector healthcare employers respectively. They put forward some of the concerns that employers have when it comes to the protection of staff and what more can be done to reduce needlestick injuries. They suggested that staff must be motivated to comply with safety procedures and that it is up to all parties up and down the care chain to ensure compliance and good practice. They also spoke of the difficulties of ensuring identical standards across all sites as the regulations is still relatively new and not universally understood; along with more training, they suggested that there needs to be more awareness of the sheer existence of needlestick injuries in order to prevent infection and reduce accident rates within healthcare settings. After lunch, the audience came back together to listen to, and indeed participate in, a roundtable discussion about how the Directive can be better implemented in the future. Forming the roundtable were two speakers from the morning session, Gérard Pélissier of GERES and Laetitia Buscoz of BAQIMEHP, along with Dr Dominique Abiteboul of the Institut National de la Recherche Scientifique and Dr Bernard Gouget from FHF (Fédération hospitalière de France). The first part of the roundtable saw the speakers debate amongst themselves the best ways to ensure better compliance with the Directive. Arguments put forward included better training, monitoring systems and reporting protocols for staff; as detailed in other speeches, healthcare workers often do not know how to report needlestick injuries, even if they were want to. All speakers were in agreement that there is no silver bullet when it comes to the eradication of needlestick injuries in France but rather a collaborative, incremental approach is required to drive up standards across the board: it is the responsibility of all healthcare stakeholders – workers, employers, industry, trade unions – to reduce the prevalence of sharps injuries in France. The second part of the roundtable saw the speakers take questions from the audience. There was much enthusiasm amongst attendees to get their testimonies across and it was clear from the fervent debate that ensued that needlestick injuries – and the protection of healthcare workers in general – is certainly a passionate topic amongst French nurses and other healthcare professionals. A recurring theme amongst those testifying was the responsibility for freelance nurses who are not attached to any particular hospital, nor currently covered by the Directive. When they suffered a sharps injury, they explained, there was no accountability and no official channels through which to take their complaint. The speakers admitted that there needs to be more comprehensive reporting mechanisms and protection put in place for freelance nurses, alongside those who do not work in an exclusively medical setting but who still use sharps regularly, such as a care homes. Patrick Chamboredon, President of ONI, closed the Summit after the roundtable and declared it a success. He explained that this was a golden opportunity to go on to have a national conversation around sharps injuries, and indeed the protection of healthcare workers in France more widely. He hoped that the Summit would spark further dialogue with healthcare officials and, through further engagement with Olivier Véran and his office, address legislation around the protection of healthcare workers in France and Europe. The EBN and ONI would like to thank all those who attended and look forward to further events in the future. Please see below for the speakers’ presentations available to download.